Radnor Hills Mineral Water Company has officially opened their 8th production line following a six million pound investment. The official opening was marked during a visit from The Rt Hon Carwyn Jones AM, First Minister of Wales with a guided tour of the new manufacturing line which was imported from Germany. Shortly after, the First Minister cut the red ribbon and officially opened the line for business. 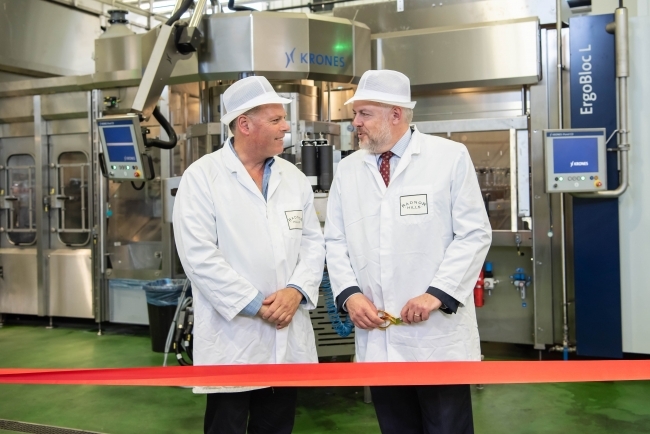 This brand new state of the art Krones technology is a result of a £6 million investment and enables plastic preforms to be blown into bottles, filled, capped, wrapped and palletised in one fully automated production line which is capable of filling 33 thousand bottles per hour and the capacity to run 200 million bottles a year. The ability to blow bottles in-line enables light weighting of the bottles and reduces the amount of PET packaging used. Radnor Hills have been creating great tasting soft drinks for over 25 years and the Welsh company has been going from strength to strength producing a wide variety of soft drinks in glass, plastic and tetra cartons. This is the eighth production line installed at Radnor Hills which is based on a family farm in Mid Wales. The farm and the company are owned by William Watkins and the surrounding land has been farmed by his family since the turn of the 20th Century. Radnor Hills are currently working with suppliers, government bodies and trade associations to increase the level of recycled plastic that is available and have recently introduced 51% recycled plastic material into the bottles they produce as of July this year. The new RPET bottles will still be 100% recyclable so that they can be remanufactured into a multitude of items. Bottles can be recycled to make T shirts, sweaters, fleece jackets, insulation, sleeping bags, carpeting and of course plastic bottles. It takes 10 bottles to make a T-shirt and 63 bottles to make a sweater. Radnor Hills will achieve zero to landfill status by the end of 2018.